Chicagoans have weathered two lackluster winters since the Snowpocalypse of 2011, but this year’s snowfall is already starting to make up for it. Just in case you’ve forgotten that winter means more than chapped lips and salt-stained shoes, we’ve compiled a list of Chicago’s coolest seasonal activities and paired each with a cozy spot that’s perfect for thawing out afterward. Do this: Sledding at Soldier Field (1410 S. Museum Campus Dr.) Warm up with this: Chai tea latte at Overflow Coffee Bar (1550 S. State St.) Thanks to the Chicago Park District, the city’s sledders are no longer at the mercy of nature. When snowfall is light, the CPD pumps out enough artificial powder to cover the 220-foot slope next to Soldier Field on Museum Campus. After a few rides down the hill, warm your hands (and your heart) at Overflow Coffee Bar, a fair-trade shop that funnels its profits back into the community. Do this: Downhill skiing at Fourlakes Ski & Snowboard Area (5750 Lakeside Dr., Lisle) Warm up with this: Housemade chili at Wheatstack (5900 S. Route 53, Lisle) With two bunny hills and ski schools for all ages, Fourlakes is especially friendly to novice skiers who occasionally french-fry when they’re supposed to pizza. That’s not to discount the intermediate and advanced slopes, which include a constantly changing terrain park speckled with slick rails and boxes. Reward yourself for face-planting only five times with a bowl of pork-and-beef chili at nearby Wheatstack. Do this: Snowboarding at Raging Buffalo Snowboard Ski Park (19-265 Western Ave., Algonquin) Warm up with this: French onion soup at Chris’ Coach House (6414 Hilly Way, Cary) Who said two planks are better than one? If you’re tired of pesky skiers showering you with powder, head to Raging Buffalo Snowboard Ski Park in Algonquin. Although the park is no longer the world’s only snowboard-exclusive area (it’s now begrudgingly open to skiers, too), boarders still reign supreme in a terrain park that’s packed with halfpipes, tabletops, and rails. After filling up on your recommended daily allowance of big air, head over to Chris’ Coach House for an Americanized version of french onion soup topped with baked mozzarella cheese. Do this: Cross-country skiing at The Morton Arboretum (4100 Illinois Route 53, Lisle) Warm up with this: Hot chocolate at The Nook (4738 Main St., Lisle) With the year’s first snowfall, Morton Arboretum’s 1,700 acres transform into a winter wonderland that cross-country skiers can explore on a handful of designated trails. The Conifer Collection trail is especially well suited to families with children who don’t yet believe that pine cones are real. To rest your weary legs after a long day on the trails, head to The Nook, a combination coffee shop and yarn store. Do this: Ski jumping at Norge Ski Club (100 Ski Hill Rd., Fox River Grove) Warm up with this: Red-velvet french toast at Brunch Cafe (935 Route 22, Fox River Grove) Although a dizzying 160-foot jump looms over this century-old ski club, four others as small as 10 and 20 feet promise thrills that are a bit less intimidating. Skiers in search of an adrenaline fix can glide across the same snow as the Olympic athletes who have been known to practice at Norge. Stick a perfect landing and head inside to Brunch Cafe, where red-velvet french toast smothered in strawberries and whipped cream awaits. Do this: Tubing at Blackwell Forest Preserve (Butterfield Rd. and Batavia Rd., Warrenville) Warm up with this: Kung pao beef at China House (2S676 State Route 59 #3, Warrenville) You might have to think twice before hopping in a rental tube at Blackwell Forest Preserve’s Mount Hoy. With 800 feet of snow and slick ice, the tubing hill promises a heart-pumping race to the bottom to anyone with $5 and the courage to take it on. The kung pao beef at nearby China House is sure to thaw out any icicles that may have formed on your fingertips. 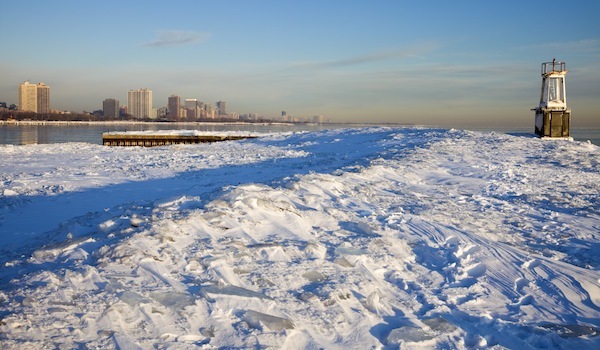 Do this: Snowshoeing at Northerly Island (1521 S. Linn White Dr.) Warm up with this: Tortilla soup at Zapatista (1307 S. Wabash Ave.) The wide-open fields of Northerly Island would be the perfect place for a snowball fight, if not for the distractingly picturesque views of Chicago’s skyline. You can scope out the city from this unique vantage point during a snowshoe trek (rental shoes are $5), which is best followed by a bowl of hot tortilla soup at nearby Zapatista. Snowshoeing is only available on select weekends when there are at least 3 inches of snow. Emily Wachowiak is a Chicago-based writer and editor.